Barrett's Boston Banter: Forces Reunite! Wow this week was CRAZY!! So many changes!!! My last few days in Avon were so good, but so sad. I said all my goodbyes to everyone. We were running around trying to visit EVERYONE before I left. One of my last teaching appointments there was with this inactive woman, Iris. Bless her soul. She has so many health problems and she is struggling a lot. She told us that we were sent to her from Heavenly Father at a really crucial time in her life. She was so grateful that we could be there for her. I was so grateful that we could be there too! It was an amazing experience. She's a sweetheart. and saying goodbye to Laurie! Then I got to go home to Marlborough with my firstborn in the wilderness, Sister Saito! It has been amazing being back with her. She is SO great! I'm so glad we get to be companions again! We had an amazing lesson on Thursday. It was our first lesson since we've been back together. Wow, Sister Saito is an incredible missionary! Such an amazing teacher! This lesson was in English so I was able to participate (thank goodness). While she was teaching it reminded me of when we were companions back in Greenfield and we had interviews with President Packard one day. When I was in my interview, we were talking about how great Sister Saito is and he just said "That woman has the spirit with her!". I can testify of that!! The spirit was SO strong as we taught about the restoration of the gospel and as we testified of Jesus Christ. I LOVE being a missionary!! My first dinner appointment in Marlborough was fabulous. We went to a Brazilian family's house and they had cooked this wonderful meal. Their dog, Pepsi, kept trying to jump up on me the whole time. At one point, I was sitting at the table and the dog had it's two front paws up on my lap. Then the dog proceeded to cough, and it coughed up some chicken onto my skirt. Sister Saito was like "Welcome to Marlborough!' and it was so funny that I couldn't even be disgusted about it. All I could do was laugh! So that was a lovely experience.. Speaking Portuguese has been crazy! I don't really speak. I just sit there and nod and smile. I'm understanding a lot more than I did before, but speaking it is different. I know I'll get better and better each day with the Lord's help. I know I'm here for a reason! These past few days have been so great. Church was amazing yesterday. The ward is incredible. The people here are so friendly and welcoming. They love the missionaries. That's always a good thing :) I'm so excited to be here! Eu amo ser um missionaria!! 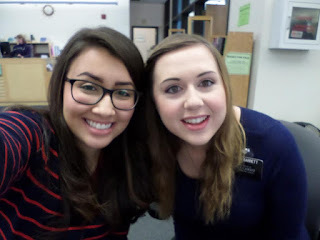 If you would like to write to Sister Barrett in her new area, you can contact myself or Maria on Facebook for the details, or you can send it to the mission home, the address for which is on the side of the page. Also for anyone wishing to send Sister Barrett something for Christmas, the final posting date for standard post parcels (through An Post) is December 7th. Thank you so much for all your continued love and support!